I read the question as “One of your characters …” and I immediately jumped to the one character of mine that I was sure would be able to cook — Lisette, a young German woman who lives with her widowed father and who has a sensible head on her shoulders. Lisette Lenz is a clerk in the Army civilian personnel office on (the fictional) Ganzer Barracks near the (equally fictional) town of Zwischenkuppeln, Germany. Lisette is putting together a lovely picnic supper to have after a hike in the hilly Rhön area of northern Bavaria and southern Hesse. Lisette bought Aufschnitt (various kinds of lunchmeat), Mischbrot (brown German bread), Tilsiter, Emmenthaler and Muenster cheeses, and cultured cream butter for the sandwiches, as well as grapes and some little Cox Orange Pippen apples. 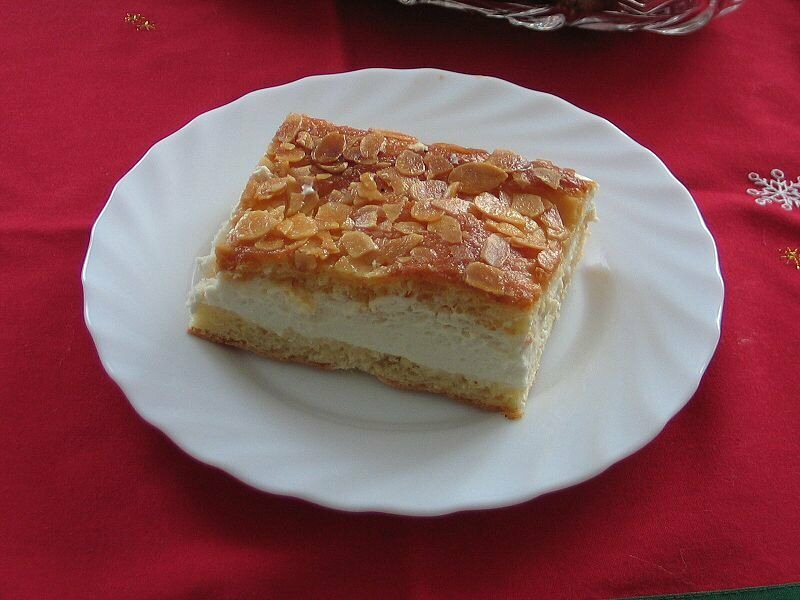 Dessert is Bienenstich, a sturdy vanilla pudding-filled cake topped with almonds and honey. For drinking, she has some Gerolsteiner Sprudelwasser (fizzy mineral water) and a bottle of Riesling wine. When I double-checked the question, I saw that it really asked for “one of your favorite characters from a mystery …” Insert a deep sigh, here. After imagining the supper I would have after the hike, nothing else sounded appetizing. To make things worse, now I want a slice of Bienenstich (and that’s pronounced BEE-nen-stish). As misery loves company, I will give you a glimpse of the cake, and provide a link to a recipe you can try.